Invicta FC 18 will take place Friday, July 29 from the historic Scottish Rite Temple in Kansas City, Mo. The event will stream live and exclusively on UFC Fight Pass. Headlining the event will be a strawweight match-up between Alexa Grasso (7-0) and Jodie Esquibel (5-1). Mexico’s Grasso has yet to taste defeat in her career. 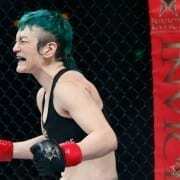 The 22-year-old has earned three straight wins in the Invicta cage, besting Mizuki Inoue, Alida Gray and Ashley Cummins. Four of her seven career wins have come via strikes. The veteran Esquibel returns to the promotion for the first time since 2014. The former atomweight will be making her first appearance at 115 pounds in the Invicta cage. 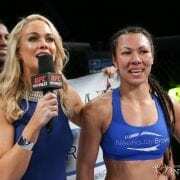 The New Mexico-based fighter rides a two-fight winning streak into the event, having bested Jinh Yu Frey and Nicdali Rivera-Calanoc in consecutive bouts. In the co-main event, Grasso’s teammate, former title challenger Irene Aldana (6-2), will welcome undefeated Brazilian Taila Santos (13-0) to the promotion in a bantamweight affair. Also joining the event will be a bantamweight match-up between Belguim’s Cindy Dandois (6-2) and UFC veteran Jessamyn Duke (3-4, 1 NC), Australian Megan Anderson (6-2) clashes with Peggy Morgan (4-3) at featherweight, undefeated Agnieszka Niedzwiedz (7-0) of Poland and Claudia Rey (6-0) of Brazil meet at flyweight, unbeaten Indian Manjit Kolekar (8-0) makes her promotional debut against veteran strawweight Lynn Alvarez (6-3), and Brazilian Jiu-Jitsu black belt Sijara Eubanks (1-1) takes on bantamweight Amberlynn Orr (0-0), who will be making her professional debut. Ticket information and additional bouts for Invicta FC 18 will be announced at a later date. Welcome back to Kansas City. My daughter and I will be there.